Imagine that you are having a mushroom salad, and your dear pooch is wagging their tail right next to you, poking the nose in your plate and obviously asking you to share with them. But wait… ‘Can dogs eat mushrooms?‘ is what you are probably wondering. Well, first of all, great news, the answer is YES. This is generally speaking; now, as we explore the subject more, we will see that there are benefits as well as drawbacks to that matter. Further down the road we will have a close look at whether mushrooms are good or bad for dogs to eat. We will learn how to prepare them; we’ll cover up such topics as wild and poisonous mushrooms for dogs and what to do if your dog had eaten them. Lastly but not least, we will provide detailed answers to some of the most frequently asked questions about dogs and mushrooms. The issue of whether dogs can eat mushrooms and if it’s good for them is surely one that occupies the minds of many dog owners. Let’s, therefore, delve into that fascinating and somewhat controversial theme. Yes, they are and no they aren’t. It really all depends. Some people won’t come near Mushrooms while others find it delicious; that’s an obvious difference of tastes. But there are humans, as well as their canine counterparts, who face a real life-danger when presented with a plate of fungal delight, being simply allergic to it. 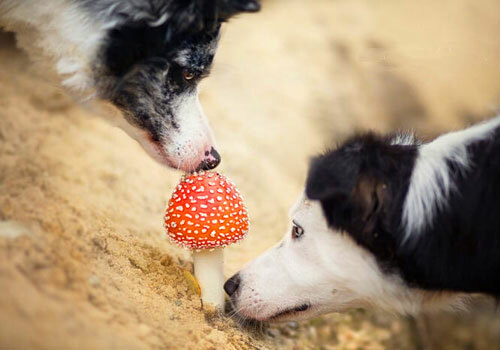 Just like humans, some dogs will gobble down a mushroom before you call Jack Robinson, who won’t be of much help in the case of a poisonous one. Remember, wild mushrooms are absolutely off limits unless you are an expert. Many of them are fatally dangerous and can cause permanent damage or even kill. Although many would classify mushrooms as vegetables, it really isn’t… it is a fungi. This food has plenty nutritional benefits and is a fantastic source to get your supply of niacin, riboflavin, essential minerals, selenium, copper, iron, fiber, potassium and phosphorus from. Another undeniable plus is their low calories, fat and carbohydrate count. Mushrooms sold in stores have been exposed to UV light during or after harvesting, which causes them to produce vitamin D, so they are even more abundant with health ingredients than those found in nature. It is actually the absolute best and safest option to get the mushroom supply for your dog. Many stores sell mushrooms and some even organic. You just know that these will be great for your furry buddy to snack on. So, back to the question ‘Are mushrooms good for dogs?‘ Yes, they are. They provide light, low calories treat for those pups who love this kind of food. They are abounded with vitamins and minerals. They don’t have sugar in them, which makes it a great snack for dogs that suffer from diabetes or carry extra weight. Their iron compound will benefit canines struggling with anemia, and vitamin D complex will help to strengthen any dog’s immune system. So far we have established that mushrooms are good for dogs. Now, after having said that, it is important to talk about the drawbacks of giving fungi to your pet. As we said before the answer is dual. Let’s have a look, therefore, at why are mushrooms bad for dogs? Why Are Mushrooms Bad for Dogs? Some mushrooms are simply dangerous for people and dogs to eat for the reason of being poisonous. Consuming those mushrooms poses a serious health risk and might even cause death. Studies have shown that certain types of wild mushrooms carry high levels of harmful chemicals and heavy metals. To avoid these, it is most recommended to consume merely mushrooms that have been grown in proper conditions. Cultivated mushrooms purchased in a store should be given in moderation. Firstly you’d need to establish that your furry companion isn’t allergic to fungi. Having established that, still proceed with caution. This food is known to give gasses. If given in excess, it might cause serious bloating and other gastrointestinal discomforts. Mushrooms can be tricky and hard to identify. Some types, both good and poisonous mushrooms for dogs, look very much alike, and it is hard, at times, to distinguish properly between the two, especially when they grow next to each other. Vomiting and diarrhea will usually appear within first six hours after dogs eating mushrooms. This condition is the most common, usually isn’t fatal and passes within 24 hours. In this state pupils might become very small. The most serious sign to be alarmed with is slow heart rate. This clinical condition will mostly occur within six hours after ingestion and demand veterinary care. This state will be accompanied by strong abdominal pain and surges of vomiting. In this condition the mushrooms will affect the dog’s liver, causing the eyes to turn yellow; seizures might occur. This syndrome will show itself from six and up to twenty hours within consumption and most definitely demand veterinary interference as soon as possible. The most common mushroom to cause this is the Amanita Phalloides (The Death Cap Mushroom). This will be caused by none else than the so called Magic Mushrooms, which are in fact illicit drugs in most places. If you are in a festival or backpacking, you might realize that your dog has pulled something they shouldn’t have out of somebody’s backpack, when their behavior changes. The animal will be restless, snapping at imaginary flies, depressed, and staggering at a walk. Seizures and tremors might occur and even coma. This condition requires urgent veterinarian treatment: decontamination and monitoring. The situations mentioned above are to be aware of and can mostly be avoided by simply feeding your pooch solely supermarket or deli purchased mushrooms. Needed mentioning is also the fact that 99% of mushrooms are actually barely or not at all toxic. Now let’s have a look at different ways of preparing this delicacy before serving it to a dog. How to Prepare Mushrooms for Dogs? Here we are talking about edible mushrooms: portobello, cremini, porcini, white button and oyster. Mushrooms that are most beneficial health-wise are Maitake, Shiitake, and Reishi. It is wise not to give your furry friend more than one or two in one go since in large amounts even these may cause severe gastrointestinal distress. Mushrooms can be fed to the dog raw but, given the fact that it is mostly during our own dinner that we share some ‘shrooms with them, they will probably come in a cooked form. When cooked, make sure that they are not overly salted, since salt can be toxic to canines, no garlic is also a good idea. Thorough cooking of the mushroom will destroy any compounds that might lead to gastrointestinal irritation. Most dogs are lacking the enzymes that break down the bit of sugar and fiber existent in the mushroom. Feeding raw fungi will increase intestinal gas, especially when feeding it whole. Cook it well then, slice it up into small pieces. You can add some vegetables to it, like peas or pumpkin, and there you have a delicious and super healthy dietary variation for your pet. Having established already that you should avoid letting your dog eat wild mushrooms, let’s talk about what to do if such situation still presented itself. My Dog Ate Wild Mushrooms! What to Do? In general, mushrooms and dogs don’t mix well. If you have any reason to believe that your beloved pooch had had a wild mushroom, act before it is too late. Don’t wait for the signs to appear, it might take up to six hours. Contact your vet at an instant or get the dog to the nearest pet hospital. Time is crucial here. The sooner you act, the better it is for your dog and you. Pick up a few samples to show the doctor who will be looking at your dog. It will help them to determine the appropriate line of treatment. It is best to wrap the mushroom samples in a paper towel and then place it in a paper bag (it helps to keep them dry and fresh). This concoction should go in the fridge for whenever you’re asked to attend the examination with your pooch. It is crucial that you don’t panic if worse comes to worst. Your dog has no one to rely on besides you, so keep your common sense attached and pause the panic button for later. Look attentively, see how the dog behaves. See if you have got any paper to wrap the mushrooms in. You do have some time before the poison kicks in, so act quickly but rationally. Also, sometimes the dog might become comatose for a while and later this state will pass; be patient and give it time. Seek professional help. Watch the following video which displays the effect of consumption of wild mushrooms on dogs. Now that we’ve covered most of the issues regarding dogs eating mushrooms, let’s answer some of the most frequently asked questions on dogs and mushrooms. Can Dogs Have Mushrooms? 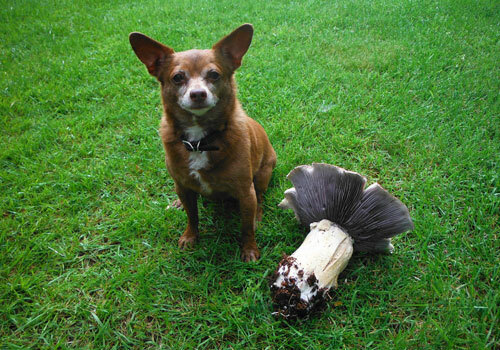 Are Mushrooms Safe for Dogs? 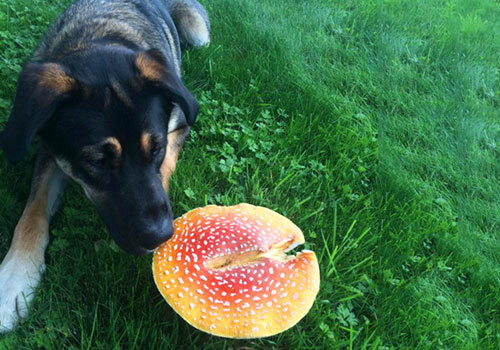 Yes, dogs can have mushrooms. 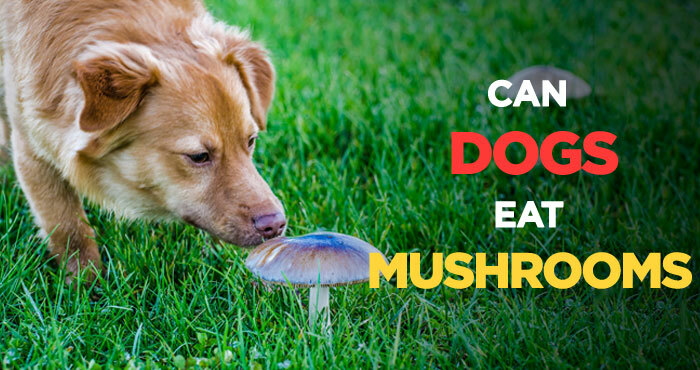 Most mushrooms, 99% in fact, are absolutely safe for dogs and humans to eat and are even beneficial. The remaining 1% though can be highly poisonous, its consumption possibly resulting in unpleasant intestinal disturbances and might even lead to death. Caution must be exercised: it is always best to eat mushrooms purchased from a store and never let your dog eat wild ones. Can Dogs Eat Cooked Mushrooms? Or Raw Mushrooms? The answer to that question is positive. Dogs can certainly eat cooked mushrooms as well as raw. Good to keep in mind that raw mushroom will create more gas, whereas cooked and thinly sliced mushrooms will be easier for your pooch to digest. 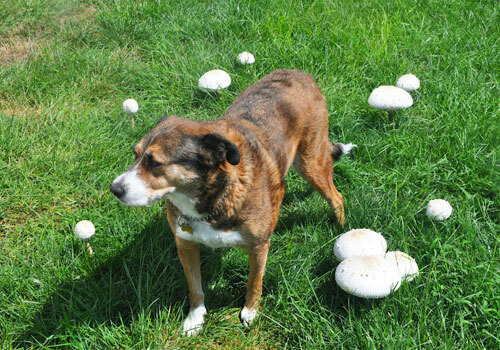 Are Mushrooms Poisonous to Dogs? 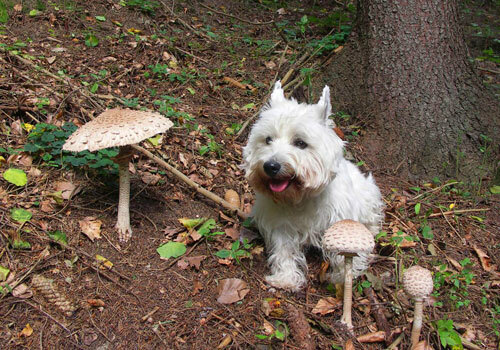 Even though the mushrooms in your yard don’t necessarily pose a threat for your furry explorer, you should still treat them as wild and, as said previously, never let your dog eat wild mushrooms. The mushrooms in your yard might be poisonous or they might be not. It is better to be on the safe side. If your dog ate mushroom in yard, then take him to the vet for the examination. 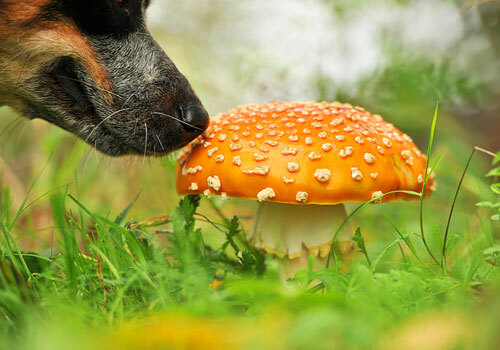 Are Dogs Allergic to Mushrooms? In this case, canines are just like humans: some are allergic to mushrooms, and some aren’t. The danger lies in being allergic without knowing it. It is wise, therefore, to have a tryout and give at first a tiny bit, perhaps a slice or two, just to see how your pooch reacts. Monitor them closely to see if they act suspiciously. Same goes for puppies as for mature dogs: no more than two mushrooms, better cooked and cut, spare the seasoning. Mushrooms are actually good for pups, being considered ‘a poor man’s meat‘, they provide great nutritional value with low calories and fat count. Hopefully, now you feel a tad more enlightened regarding the question ‘Can dogs eat mushrooms?‘. First and foremost, yes they can but with great precaution. Only give them mushrooms purchased from a store, such that you would feel safe eating yourself. Pups can enjoy mushrooms too. But don’t try to replace their regular dog food with it. 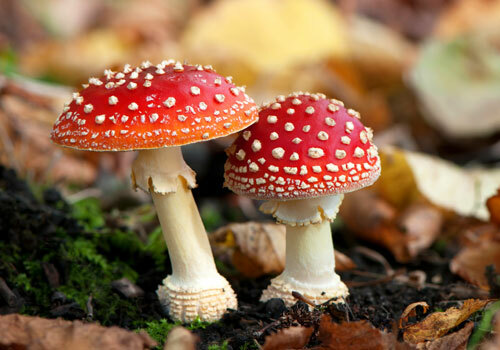 Before giving them a whole mushroom, check whether they are allergic to it or not by letting them taste a small amount. In your back yard harmless and harmful mushrooms might grow together, side by side, making it very hard to distinguish between the two kinds. It is therefore, wise to pluck them all out to avoid accidents. 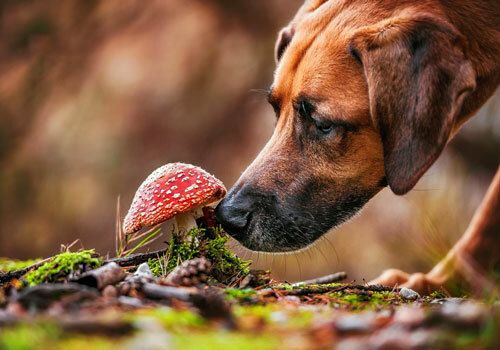 So, not only that it is a big (although cautious) yes when it comes to answering the question ‘Can dogs eat mushrooms?’, but it is even recommended, especially when talking about providing a well-balanced diet or maintaining an over-weighed pet. Mushrooms are abundant with nutrients, vitamins and minerals, iron and other highly beneficial stuff, so it would be a shame really to miss out on all these. Some dogs are crazy for this treat too, absolutely loving it. Steaming will lessen the gas conductors in the mushroom as cooking would, while retaining all the healthy ingredients. When serving mushrooms, the simpler the better, bland goes a long way. Avoid seasoning and butter, since the latter is a milk product and might upset the stomach. Did you find this article helpful? Then I am sure you would be interested in seeing if you can feed your dog fruits, such as apples, oranges, cherries, blueberries and pineapples. Can dogs eat shrimp, a scrumptious seafood food that's rich in protein, vitamins, and minerals or will your dog turn his nose up and walk away from this great chewy treat.